I spoke to the amazonite stone my truth, what my heart desires, and put it on the roof of the tiny shamans living on my front porch; the honey bees. Why did I do this? Chapter VII of the Egyptian Book of the Dead is the Last Judgment. The day that Ani (or any deceased), is expected to enter the Hall of Maati or the Hall of Two Truths (note the connection to the neter Ma’at) and weigh their heart against a feather. Osiris the ruler in the Hall and Thoth is the judge of the proceedings, while Anubis watches over the scales. Ma’at, the Neter of truth, balance and harmony is present as well. There are others present at the proceedings, such as the monster Amemit who would eat the heart of the deceased if the deceased heart did not measure up and the evil outweighed the good. I find it interesting that it is mentioned that the Neteru not only “live” on truth, but also “eat” truth. To me, it seems as if this implies that the Divine, lives on truth. In this way, the part of us that is Divine, our Spirit, lives on truth as well. When we are true and living from our heart, our Spirit has “food” to live on and thrive. It is when we do not live our truth, that our Spirit dwindles and starves. The 7th chapter in the Egyptian Book of the Dead was engraved in Amazonite. Amazonite was found in all types of jewelry in Egypt ,including an amazonite scarab ring found in Tutankhkomen’s tomb. I think the connection of feeding your Spirit truth is a good explanation for this stone to be as prevalent as it was during a time when your good and bad would be weighed at your Final Judgment, to determine if you are bound to the monster Amemit (Ammut) after he eats your heart, or join the Followers of Horus in the Kingdom of Osiris forever and drink beer and eat bread. Ma’at, the Neter of truth, balance and harmony holds the feather that the heart is weighed against. She is the force that guides order from chaos and lives with moral integrity. I think of her as a bee…bringing order to chaos and living from the truth of the heart. Amazonite is the stone of truth, balance and harmony, a perfect match for Ma’at. It is a stone for communication and can help one speak their truth. It can help you manifest your dreams; some people have an easier time dreaming their truths rather than living them. 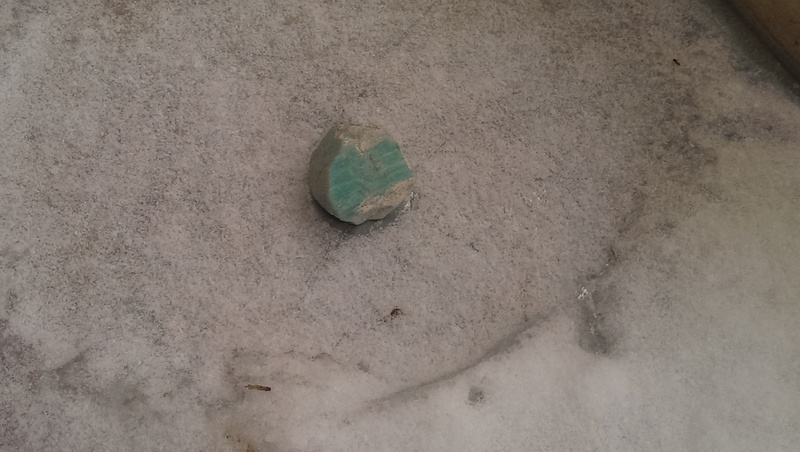 Amazonite can help you bring those truths into your reality and communicate to the Universe what your heart desires, what truth will feed your Spirit. In the Homeric Hymn to Hermes, the Melissai feed on honey and are then inspired to “speak the truth.”. Honey, another truth-speaker. It seems that bees, Ma’at, and amazonite all have a role in the truth of the Spirit. What have you done to feed your Spirit truth recently? When your Spirit is getting enough to eat, you feel vibrant, healthy and creative. If you are not feeding your Spirit well you tend to feel less energetic, sad or even a little hopeless. It is easy to fall into the “Spirit starvation” trap this time of year, when activity is lessened. Just because physical activity is lessened, doesn’t mean that spiritual or mental activity needs to be lessened. Your Spirit needs feeding at this time of year as much, if not more than other times. Since we can’t help to balance our Spirit diet with as much physical activity, it is even more important to take the time to do the things that stimulate your creativity on an inner level; read a book about something inspiring, color a picture of what you want to create in your life, plan out a garden for the spring, or clean out that closet to clear the space for newness. Whether your heart will be weighed in the Hall of Maati or not, it feels good to live in your own truth and feed your Spirit. Make sure to do something today to feed your Spirit Truth. Today, I am connecting with the honey bees and sharing my truth with them…my Spirit feels full!